Playing with an air canon is always fun. You can use it to propel little tissue balls or have a race to see who can make the balls fly the farthest. 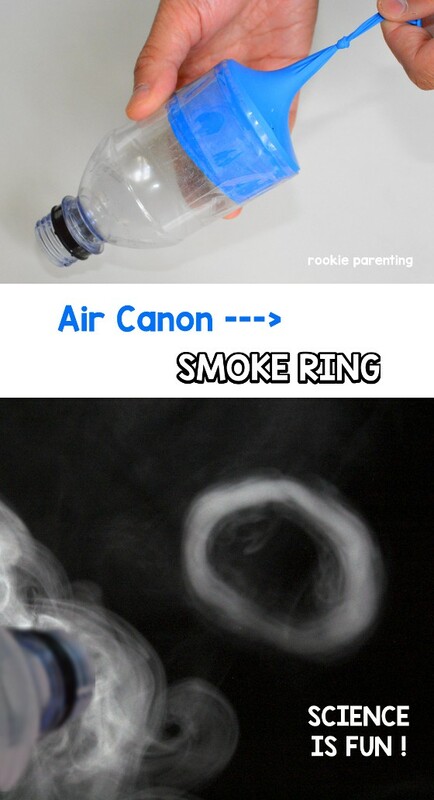 But did you know that you can also make a smoke ring with it? Warning: adult supervision is required whenever you do things involving fire. Cut out the bottom of the bottle. 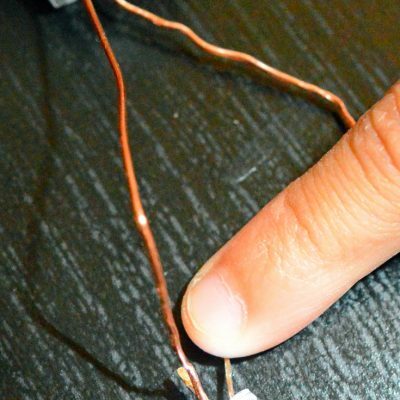 Make sure the cut edges are smooth so that they don’t poke through and break the balloon. Tie a knot at the opening of the balloon (no inflating). This will be the trigger. Then cut off about half an inch at the other end of the balloon. 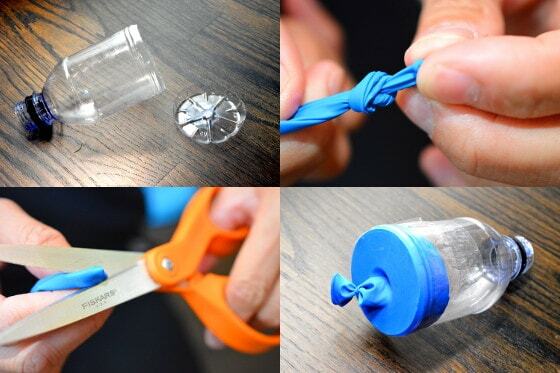 Stretch the cut end of the balloon and cover it over the cut bottom of the bottle. 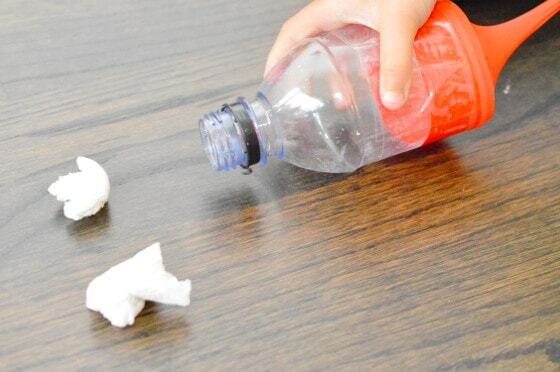 Tape the balloon onto the bottle so that it doesn’t slip off when you pull the knot out. 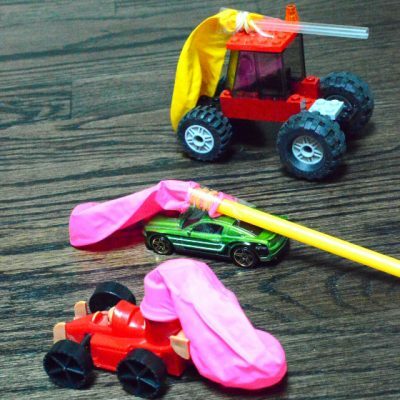 To play, pull out the knot and release it quickly to shoot air at small balls of tissue paper. 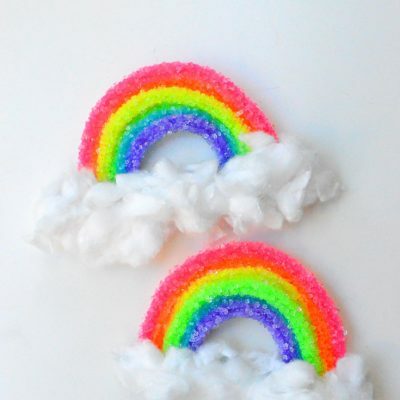 See how far they can fly. Try to “fire at” the tissue balls from different distances and see how far they go. Use bottles of different sizes to see if there is any difference. To make a smoke ring, light an incense and blow out the fire (since we only want the smoke). Carefully insert the incense into the bottle but do not let go. Make sure the tip does not touch and melt the bottle. Cover the mouth of the bottle with your hand while holding the incense inside for the smoke to build up. When the bottle is filled with smoke, uncover the bottle and remove the incense. 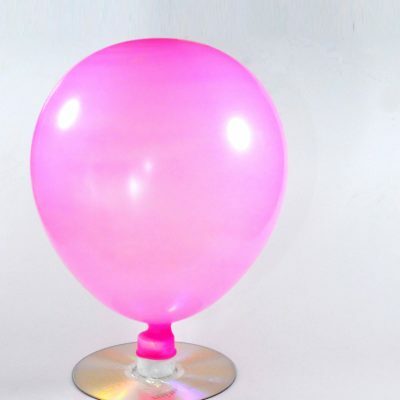 Now, in a lightly lit room, tab the balloon membrane gently and you will see a ring of smoke come out. It is easiest to see against a dark background. How does the air move? 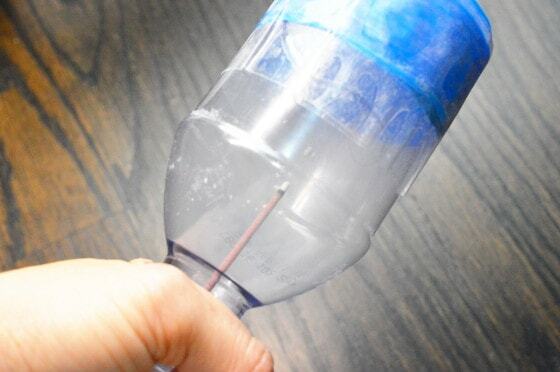 In this experiment, you can see how air flies out of the bottle by watching the smoke. A vortex is a spinning donut of air. The air near the center of the donut rolls out from the center to the edge. This is because the air leaving the bottle at the center of the opening is traveling faster than the air leaving near the edge of the hole. At the same time, this outcoming vortex is traveling faster than the outside air and therefore has a lower pressure (as depicted by Bernoulli’s principle). The resulting inward pressure from the surrounding air holds the ring shape together. As the ring travels, air friction slows it down and eventually it blends with the surrounding air and the smoke ring appears to have drifted away. Here is a great picture of how the ring of air travels.